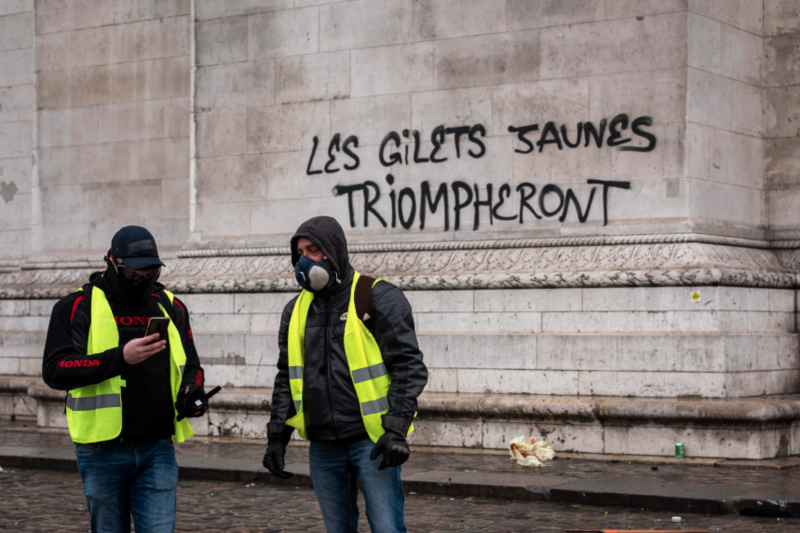 The "yellow vest" uprising is about more than Macron's ill-conceived fuel tax. It's symptomatic of a system-wide failure that must be fixed before it's too late. PARIS — The crisis that is underway in France — and in most other developed countries, for that matter — is serious. But, in equal measure, it also offers hope and brings with it an opportunity for reinvention. Everyone feels, given the deployment of verbal and physical violence in the country, that there's more to this an ill-conceived carbon tax hike, for which Prime Minister Edouard Philippe has finally announced a six-month suspension, to try to quell the uprising of the gilets jaunes ("yellow vests"). This tax was inappropriate for several reasons. First, because it's based on a falsehood: the idea that by upping taxes on the estimated 40 million motorists in the country — representing less than 1% of the world's population — France will contribute to the fight against global warming. The latest forest fires in California alone represent one year of CO2 emissions from France. This tax was also inappropriate because it was deeply socially unjust. It would have hit millions of French people, especially large families, who were pushed tens of kilometers away from our cities because of the high housing costs in metropolitan areas, and who have no choice but to drive tens of kilometers to work, live or survive. These are all symptoms of a larger problem. The French executive will have to fix this mistake and at the same time restore public order, which has been allowed to drift seriously in recent weeks. But that's just the starting point. Our leaders will then have to focus on the long-term crisis that is being expressed today in France. It's a crisis of meaning, first of all: What exactly are we working for, if we cannot make ends meet or prepare a future for our children? Or when 48% of the wealth we produce is taken by a state that we can hardly hold accountable? Why do we continue to be together on this piece of land in Western Europe? Are we still a French nation with a common past, present, and destiny? Or are we already pieces of heteroclite ethnic, religious and social communities, corseted by such an undemocratic "thing" — to use General de Gaulle's description of the UN — as the European Union? Offering technocratic solutions to adapt the current model won't break the deadlock. Rather, we need the courage to rethink the model in all its dimensions. Deep down, even the high-earning readers know very well that the excessively financialized capitalism of 2018 is not sustainable in the long term. The next financial crash linked to global over-indebtedness is only a matter of time. New technologies are pushing entire sectors of the population out of work. Inequalities are widening across the globe, in every country. These are all symptoms of a larger problem. We must rethink this system, which has had no adversary — and therefore no challenge — since the fall of Communism in 1989, just as we must get out of the false European pretenses that produce fine speeches but are not followed by any sort of reality. The European army will never see the light of day because nobody wants it. And the Franco-German partnership? Mrs. Merkel's inertia, her crazy and unilateral decisions on nuclear power and migrants have wiped out this fine dynamic. Despite all the efforts of France's German-speaking finance minister, the Merkel government's delaying tactics to avoid the rapid adoption by the European Union of the much-needed and urgent "digital tax" on the GAFA (which would largely cover the revenue shortfall of the carbon tax) are the latest example of this apathy, which is also contrary to common European interests. Rather than fight global warming, let's anticipate it in terms of land planning, from our coasts to our vineyards, and in terms of new sources of energy. Should we really disfigure our landscapes — which are the face of France at the same time as an essential source of tourist income — with unproductive wind turbines? What about biomass? Solar energy? France can no longer be ruled from top to bottom. Since no one respects European balances, starting with Germany and its dangerous trade balance surpluses, let's prepare a major infrastructure policy aimed at strengthening our sovereignty and securing our sources of national wealth for the coming decades. If the collapsed France of 1944 was able to acquire nuclear weapons just 10 years later — thanks to its still-living industrial genius, and to General de Gaulle — why on Earth wouldn't the France of 2018 be in a position to, in a few years, rebuild its current sources of sovereignty and prosperity? I'm referring here to digital technology, "green" industries, health — a sector in which we had world leadership and have been abandoning — and, of course, our military defense and civil security tools, which we are rediscovering as a priority in the wake of recent events in France and growing hostilities around us. We need a new perspective and a change in how government operates. In the age of digital networks, France can no longer be ruled from top to bottom by a Parisian Jacobinism as ineffective and illegitimate as the centralism of Brussels. On the contrary, the time has come to revive the initial intuition of the En Marche movement that got Emmanuel Macron elected, by giving local authorities, town halls, departments and regions the power to set up local initiatives and then test, evaluate and possibly extend them nationwide. "Men are like apples: When you pile them up, they rot," French Revolution leader Mirabeau once wrote. It's by applying the principle of local subsidiarity — that social and political issues should be dealt with at the most immediate level consistent with their resolution: by setting up a human and incentive-based ecology, and by making it its priority objective to reclaim our sovereignty that the French executive will finally be able to give a new perspective and meaning to a French nation that is suffocating.